An Israeli aircraft has fired missiles at a building in Syria's Golan Heights in response to a rocket strike on an Israeli village, according to reports. Syrian state TV said "several missiles" had hit a transport centre and public building in the Height's Quneitra area. Earlier rockets landed near a village in northern Israel. There are no reports of injuries in either attack. Israeli officials blamed the rocket strike on the Palestinian group Islamic Jihad, which denied the claim. 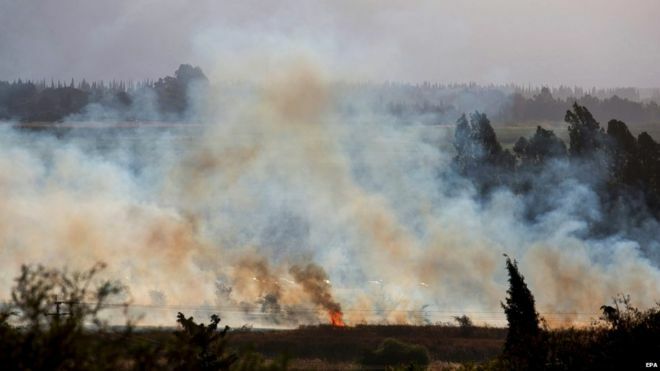 A statement released by the Israeli military said the rockets that hit the upper Galilee region "were launched from the Syrian Golan Heights... by Islamic Jihad, sponsored by Iran". The statement went on to say that Israel "holds the Syrian government responsible for attacks emanating from Syria". Islamic Jihad had previously threatened reprisals should one of its activists in Israeli detention, Mohammed Allan, die of a hunger strike, but Mr Allan called off his fast on Wednesday after an Israeli court suspended his detention.Mr Allan is believed to have suffered brain damage after going 65 days without food. Syrian state news agency Sana confirmed the Israeli strikes had hit but said there were no casualties. Islamic Jihad's leaders are based in the Syrian capital. Dawoud Shehab, a spokesman for the group who is based in Gaza, denied it had fired on Israel. "Israel is trying to divert attention from the defeat that it suffered in the face of the determination of the hero prisoner, Mohammed Allan," Shehab told Reuters. Islamic Jihad has publicly acknowledged receiving support from Iran, a connection Israel has sought to highlight as it campaigns against the proposed US deal with Iran. The stretch of border involved in the exchange has been largely quiet since the 2006 war between Israel and the Lebanese guerrilla group Hezbollah. Israel captured the western Golan in the 1967 Middle East war and annexed it, a move not recognised internationally.